Nurses' complaint triggers Oregon Health Authority investigation of St. Charles Health System in Bend. 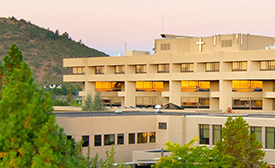 St. Charles Health System in Bend. A team of experts has investigated the operating room at St. Charles Bend, the state's only high-level trauma center east of the Cascades. This came after nurses filed another complaint with the Oregon Health Authority in late September. Carla Stevens, a senior director of perioperative services at St. Charles, said that’s false. “We always have safe staffing here. We would never go to the operating room without the appropriate level of staff,” she said. But, Joel Hernandez sees it differently. He’s a registered nurse who has worked in the hospital's operating and emergency departments for about two years. “I’ve experienced one occasion personally, when I’ve shown up and then I’ve gone into the operating room, like, ‘OK, we’re ready to go,’ and then there’s no team available,” he said. Hernandez said the patient, in that case, could wait but added, “it’s a gamble we’re taking.” He claimed surgeries scheduled months in advance have gotten pushed back, and on other days the trauma team in place to respond to emergency situations is stepping in to do scheduled surgeries. Stevens said she’s not aware of any elective surgeries being rescheduled. The nurses' allegations come about a year after the hospital announced layoffs and pay cuts to avoid a budget shortfall. Meanwhile, financial reports show an operating margin that’s back in the black, up more than 10 percent since the first quarter of 2017. Dr. David Lehrfeld, who heads the OHA program for certifying trauma centers, outlined the criteria operating rooms must follow. “There can't be any evidence of imminent life safety threats and get a verification,” he said, emphasizing that St. Charles is not in danger of losing its standing as a trauma center. His team investigated the latest nurse complaint when it was already expected at the Bend facility for a routine follow-up survey of quality measures. It found minor deficiencies in the trauma systems at St. Charles a year ago, Lehrfield said. The team did the routine survey and investigated the complaint on the same day “as a matter of logistical convenience,” according to Lehrfeld. This time the survey found no deficiencies, according to Stevens. As for what the state found about the latest staffing complaint, she said, "we'll just wait for what their findings are."